Ship spotting is still possible! Last night I had to go to the Waterfront to attend a function at the V&A Hotel. With my mind on autopilot, I found myself on the far side of the Waterfront heading towards the Table Bay Hotel. Nonplussed, I was lured to park by the sight of the MSC Barbara being accompanied into the harbour by two tugs. The lull in the winter weather seemed to have inspired a couple of ship spotters to the area and there were a few of us taking photos as she headed into the port. 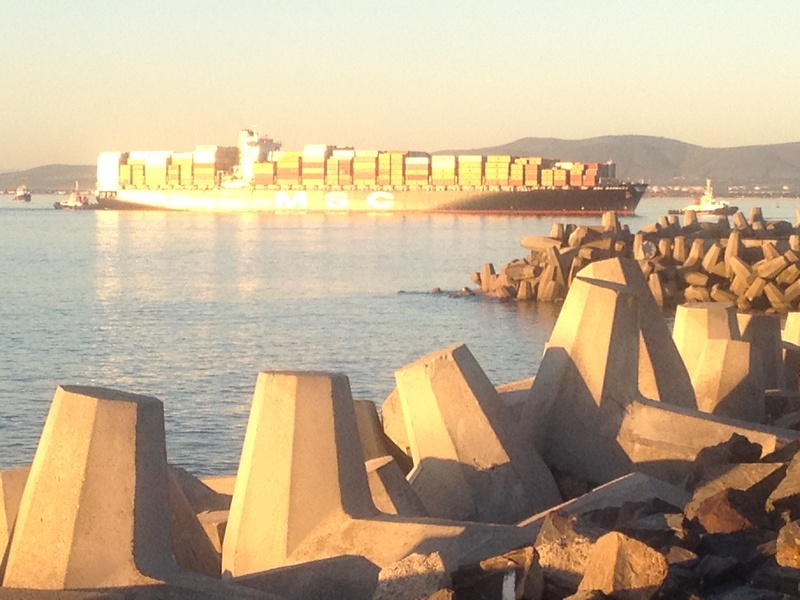 The MSC Barbara enters Cape Town harbour. At this point I was still under impression that I was at the correct venue for my function, so I ambled into the hotel only to find, of course, that I was meant to be on the other side of the Waterfront. A helpful employee of the hotel suggested I remain in their free parking area and just walk across, so I took advantage of the lovely evening and started the journey. And I am glad I did. Berthed directly outside the Table Bay Hotel was the Navy Frigate, but what was really attracting some attention and cameras was the Bourbon Clear. With her distinctive bow and bright green hull, she cuts a striking figure and had more than a few people stop in their tracks. 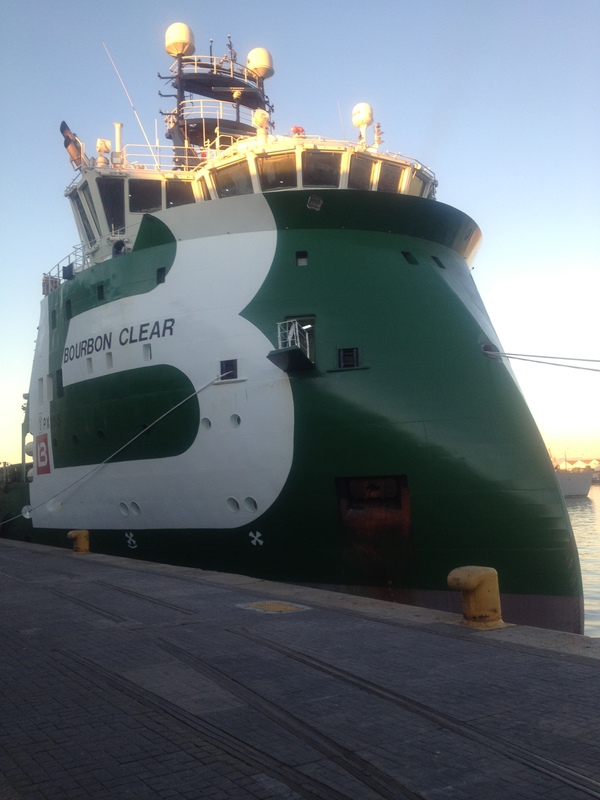 The Bourbon Clear, a Large Platform Supply Vessel, in Cape Town harbour. The Bourbon Clear is a Large Platform Supply Vessel designed by Ulstein Design and built by Zheijang Shipbuilding. She was delivered in 2010 to Bourbon Offshore (Norway). She is built according to Det Norske Veritas Clean Design notation and carries a Green Passport complying with IMO ship recycling recommendations. Walking just a little further, an assortment of vessels were berthed facing the diners while just across the harbour I could easily see the fishing vessels bobbing against the I&J jetty. The brightly lit oil rig currently occupying A-Berth and towering above the Waterfront buildings completed the maritime picture as I finally found my way to the correct venue. We lament the fact that the ISPS code has restricted access to the harbour, but as an industry we could do more to project what is visible into the public eye. We just need to be a little more creative about showcasing our industry!